It is an antispasmodic and acts on muscle tissue to reduce over-contraction. Vasodilator which in turn modifies blood pressure. Valerian is widely used in Europe for insomnia, excitability and nervousness. May relieve symptoms of pre-menstrual tension. During times of mental over-excitability and those that find it difficult to switch off. Helpful for shoulder and neck tension or any stress related condition. May relieve tension headaches. May be helpful in reducing blood pressure but should not be used in conjunction with any other medication. May be used during times when your pet is exposed to a new and stressful event ie first time showing, when traveling etc. May be useful after a long and strenuous work out. May be used as a diagnostic tool in assessing if head flicking is caused by fluctuations in blood flow through the nasal passages. Anti-spasmodic action may make it helpful for mild cases of epilepsy, staggers and tying up. May be used during times when the horse is exposed to a new and stressful event ie first time showing, first few races, when travelling etc. Horses that habitually tense muscles during a training session. Relaxes over contracted muscles. Also will help soften the topline during advanced dressage training. 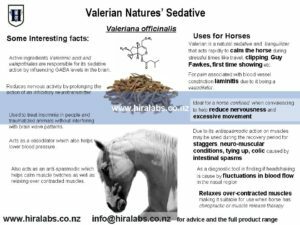 Anti-spasmodic action may make it helpful for mild cases of colic and the secondary effects of tying up. Low grade laminitis causes constricted vessels and pain. 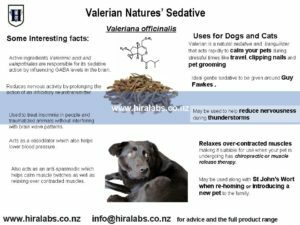 Valerian acts as a vasodilator which may relieve some of the pain.